Have you experienced 4WD Hire Cairns? Help others learn about this company by sharing your first-hand information with other road-trippers. If you the type of traveller who would want to explore the outback regions, then 4WD Hire Cairns is a great option to satisfy your off-the-road demands. This rental business focuses on rugged vehicles that will take you to rugged places in Cairns, Cape York, and Cooktown. These areas open up a road trip packed with outdoor adventure and spectacular wildlife and nature interaction. 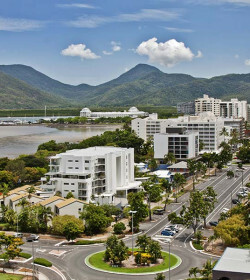 The company's main branch is located in Cairns City but pickup and dropoff of units can be done at the airport so that renters can start their trip as soon as possible. The company features a well-rounded rental fleet―4WD cars, 4WD campervans, sportscars, and minibus. 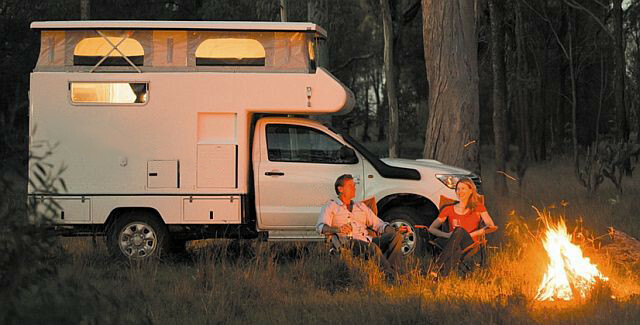 There are 7 options for the 4WD campervan range, all of which are Toyota models, either Hilux or Landcruiser. 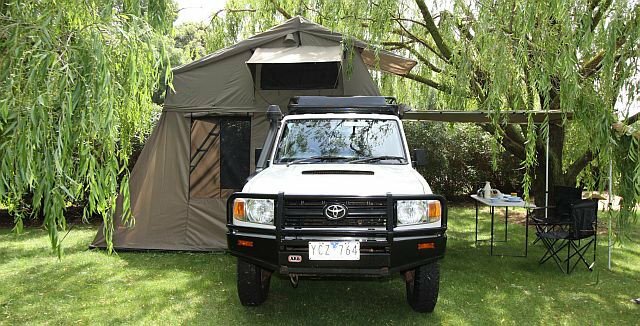 These units are great for couples or families up to 5, who want to explore the Far North without ever doubting if their unit can make it to the outback landscapes. The perfect off-the-road partner for couples, this Toyota Landcruiser lets you tackle tough terrains with ease and comfort. 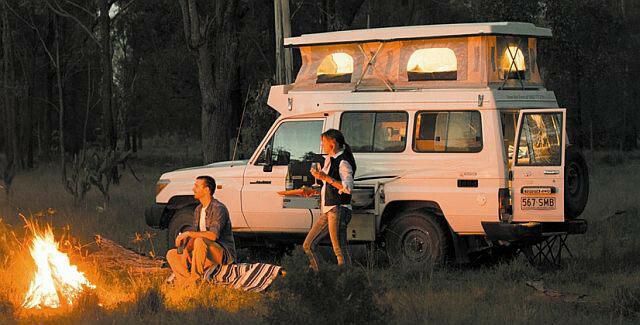 This 0-3 years old 4WD pop-up camper provides a convertible living space that becomes a nice sleeping area at night. The pop-up roof could be another sleeping option or extra storage space. The slide-out external kitchen, together with the awning and chairs, gives that alfresco vibe. Also, the unit is furnished with a fridge. 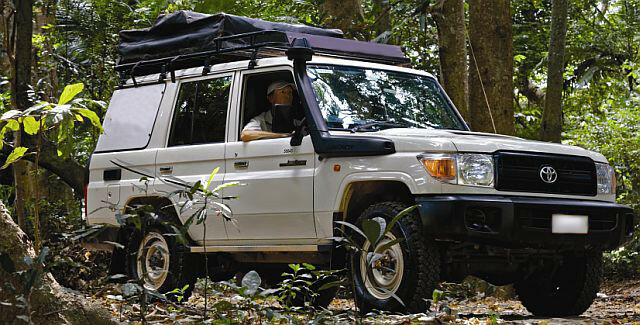 Another option for couples is the older Toyota Landcruiser. This one is relatively the same with the above-mentioned campervan, well, except for the vehicle age, which is 3-5 years older. 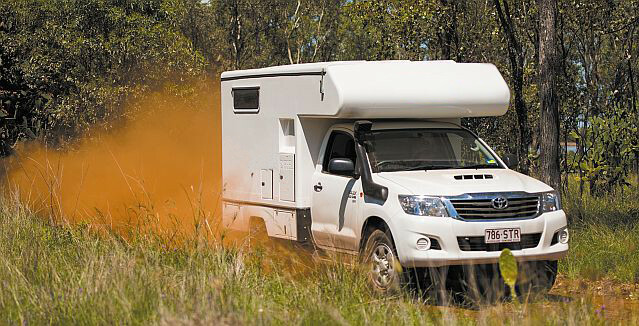 Still, this 4WD is a durable campervan recommended to explore some tough landscapes. It also comes with a nice slideout kitchen with all the essentials that you need, including a gas stove, kitchen sink, and 32-litre fridge. The pop-up double bed is such a cozy space to unwind. 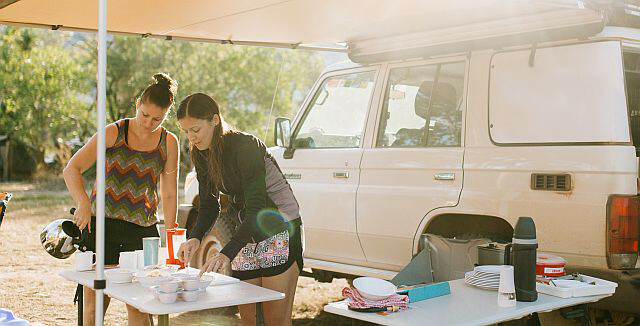 Seating and sleeping 5, the Toyota Landcruiser is armed with a unique rooftop tent design that caters the entire family comfortably. 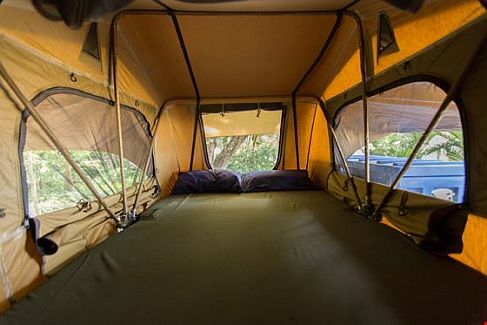 The rooftop tent allows up to persons, while the extension tent below with self-inflating beds accommodates up to 3. 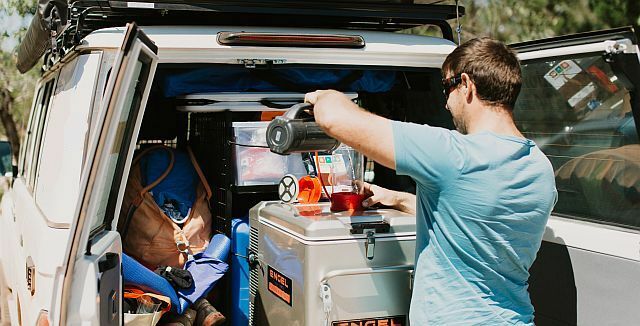 The unit takes pride in some fancy features like the modern fridge and freezer technology, ratchet straps, and shaded awning. Though the unit is commended for families, this is also great for couples or even solo travellers wanting extreme space. These 0-3 years old Toyota Landcruiser models would be the next favorite camper for a family of 4. If you're travelling with a kid, then this one is a perfect match because of the baby seat, not to mention the solar shower! The interior layout is very spacious without leaving all the comforts behind, including a fully-equipped slide-out kitchen with sink, cutlery, gas stove, and fridge. At the rear is a nice storage room for your stuff while sleeping places are from the pop-up roof and ground tent. 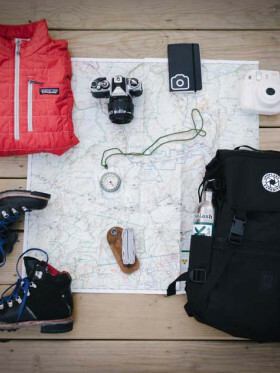 Are you an adventurous couple eyeing for comfort and style while on the road? If yes, then this unit may just be the right one for you. Sleeping up two, this Toyota Hilux offers comfort and style through its spacious interior and functional facilities. You get to enjoy some amenities, including the fridge, gas stove, portable handheld shower, and awning. Plus, there's no need to set up a tent and sleep outside because this one got a double bed from the pop-up roof. Provides accommodation for two people, this 4WD model is the best option for those on budget. Built on a 3-5 years old Toyota Hilux in a manual transmission, the unit's back area is allocated for the living area/ kitchen. The bed is positioned at the pop-up roof. For extra comfort, the unit is furnished with a solar powered shower and awning. 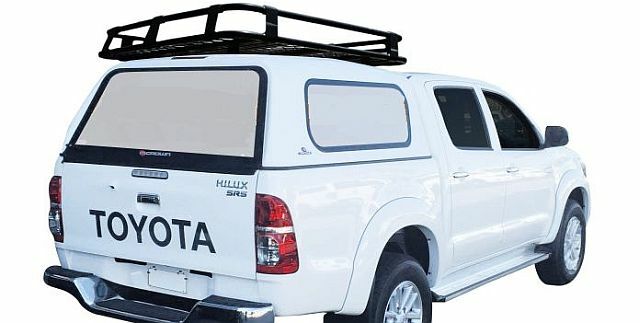 This 0-3 years old Toyota Hilux is a 4-door, 5-seater automatic 4WD that accommodates up to 5 people. It has a slide-out kitchen that is loaded with a portable stove, fridge, and food storage boxes. Sleeping options come from the rooftop tent and another tent on the ground. 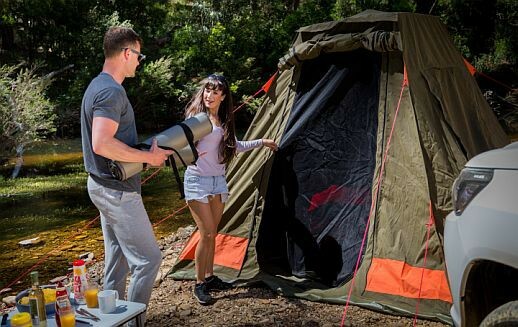 Tents are provided with self-inflating camping mats and linen. 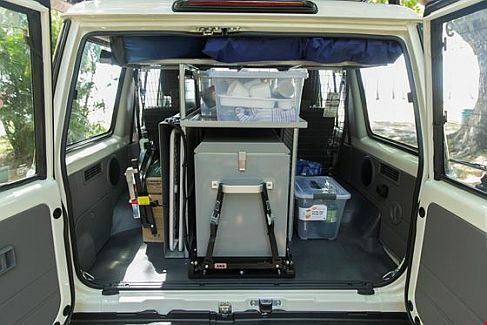 The interior of the campervan is more of a storage area for large equipment and extra luggage. 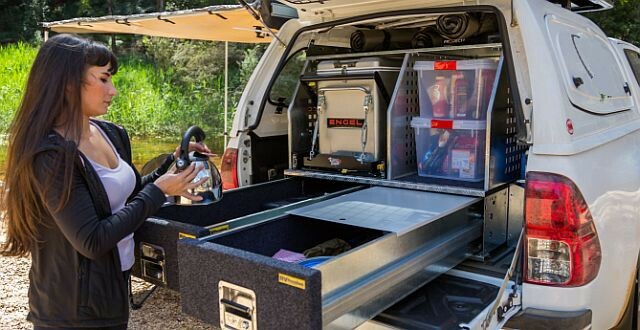 For extra convenience, a step-up extension can be attached on the wheel so that you can access the navigable rear side windows and roof rack. For Cape York 4WD Camper Rental, Cape York 4WD Hire, 4WD Campervan Hire Cairns, Cairns 4WD Camper Hire, and Four Wheel Drive Hire Cairns, the standard accident liability amounts to $8,000 but can be reduced to $2, 500 or $500 by paying an additional daily rate ranging from $41 to $65. On the other hand, Cape York 4WD Camper Hire and 4WD Camper Hire Cairns come with a standard excess of $6,000. This can also be limited to $3,000 or NIL for an extra rate of $36 to $52.50. There's also the 4WD Additional Cover at a certain amount that provides coverage for unlimited tyre & windscreen, overhead and underbody, unlimited kilometres and towing. Renting a 4WD from 4WD Hire Cairns is a good choice. Their vehicles are new models, ranging from 0-3 years old and 3-5 years old. These sturdy models are ideal for an outback road trip with your partner or your family. Though they only have one branch, their location is nicely located in Cairns City, and you can pick up your van up from the airport. 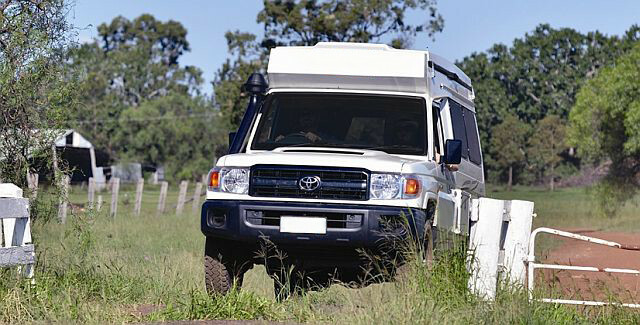 Their staff are knowledgeable about the ins and outs of handling a 4WD, which is very important because of the unique campervan type. For an off-the-road adventure, 4WD Hire Cairns holds a fleet of reliable and latest 4WD campervan models that let you explore the some scenic yet relatively restricted regions in Cairns, Cooktown, and Cape York. Have you experienced 4WD Hire Cairns?